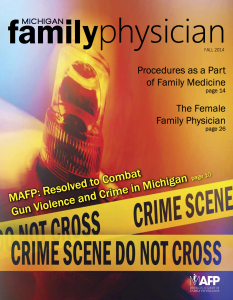 At the Annual Meeting, July, 2014, the Michigan Academy of Family Physicians sent resolutions on Gun Violence to the AAFP Reference Committee on Advocacy. This became AAFP Resolution 510 and asked the AAFP to align with other national medical organizations like the American Academy of Pediatrics. RESOLVED: that MAFP ask AAFP to advocate for repeal of sec 2717(c) of the ACA that bans health insurances in the health exchanges from collecting data about frearms in homes. RESOLVED: that MAFP encourage the inclusion of presentations promoting frearm safety and prevention of gun violence in national, state, and local continuing medical education programs as physicians look for more evidenced based strategies on how to discuss frearm safety and preventable violence with their patients.